In between Government Street and Douglas Street sits the often overlooked Broad Street. Cut into two pieces by the Victoria Bay Centre, Broad street is a pleasant and quiet street, especially in comparison to its two more well known neighbours. It hasn’t always been that way and in fact was supposed to be one of the preeminent streets in the city. Going back a little ways to the 1980’s and early 1990’s, Broad street now divided by the building of the then Eaton Centre mall in the early 1980’s, was a little lost. It had a seedy edge to it that made people usually choose not to walk down it at night. To be honest, by the late 1990’s most of that seediness had already left the area and moved on to Government Street north of downtown, but the reputation still lingered. At the same time, the city was going through a bit of a landscaping renaissance, having already started on a complete makeover of Douglas Street and parts of Yates Street, Broad Street was to be the boldest plan yet. 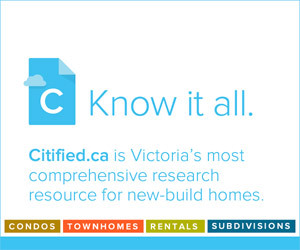 Sponsor Message: Citified is the most comprehensive resource for researching a new-build home or commercial space in metro Victoria and southern Vancouver Island. Along with the vibrant physical plan for the street, was an idea to make this quiet street the social centre of the city. A place where the City could regularly close it down for street parties or markets. You can actually still see some evidence of this today where Broad crosses Johnson or Yates, pause and look down as you walk east or west along the crosswalks and you will see little metal circles with “Earth, Air, Fire and Water” written on them. These are bollard placements for closing off the street. I can’t remember them being used even once, which is truly sad. I am sure you are wondering why the reference to the elements. Well those elements actually correspond to some historical aspects of the street and are also laid out in the actual pavement of the street. Earth refers to the farmers market that used to sit near where city hall is today. You can see a large head of lettuce mosaic close to the CFAX studio. Earth is also represented as round boulders in the street pavement design. I did at one time know what the air represented, but I cannot remember (If you know, please leave a comment below!). The wavy water lines represent the Johnson Street gully which had a stream that ran down from Fernwood to the harbour. 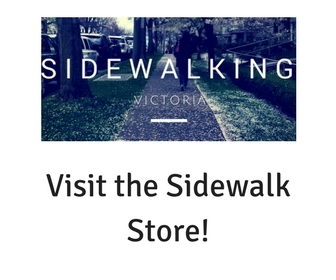 Finally, near the mall are triangles in the pavement that refers to the fire that burned down one of the two nearly identical Victoria Exchange buildings in 1910. It is hard to tell now when you look at these oil soaked shapes in the street that when they initially went in they were all different colours. It certainly made the street very vibrant with all the colours along the three block stretch. There are also still mosaics on every block of the rebuilt street, but there are also big parts missing. One of the more controversial parts of the plan was to have parts of a poem commissioned about Broad Street written down, but this was discarded as it was considered vulgar (Its funny, I went and read some of the comments in Monday Magazine at the time and I could not believe how silly they sound just two decades later). The poem was called “Broad Street Blues” written by Michael Kenyon. There was also plans to have public art at each of the four intersections. The plan described them as “pylons” but there was already a push back at the significant cost overruns on the Douglas Street renewal and here we were spending tens of thousands on public art that was not “necessary”. It is too bad really because I think that these two elements would have pushed the street to another level. EJ Spurell has a great write up on the missing poem and where you can still find bits of it hidden right in the street here. Read it, you won’t be disappointed. The pylons are unfortunately lost forever however, and I think that they really are a missing piece that would have created a sense of place along the street. You can clearly see where one of them was to be installed in a large and empty brick ringed circle at Yates and Broad. I think this would have had a gravitational pull for people to meet up with their friends. All is not lost along Broad Street though. As you walk between City Hall and the Bay Centre you have one of the most pleasant pedestrian experiences anywhere downtown. The cars are parked on an angle and have bollards between them and you. The street has a slight turn in two of the blocks. Cars move slowly along and because the sidewalk and street are almost the same level so mid-block crossings feels safe. I think that the City could go back to those original plans and see what parts we have been missing out on. Maybe rekindle the idea of some more art pieces along the street and lets start using those bollard placements and have a car-free party where it was originally meant to be downtown. If you want to read more on Broad Street, I highly recommend Janis Ringuette’s article written back in 2007 and available here.